A procurement official named in the criminal case against the military’s former second-in-command has been suspended from his position, a House of Commons committee has been told. A procurement official named in the criminal case against the military's former second-in-command has been suspended from his federal government position, a House of Commons committee has been told. Matthew Matchett was identified in court documents filed by the lawyers defending Vice-Admiral Mark Norman, who has been charged with a single count of breach of trust. 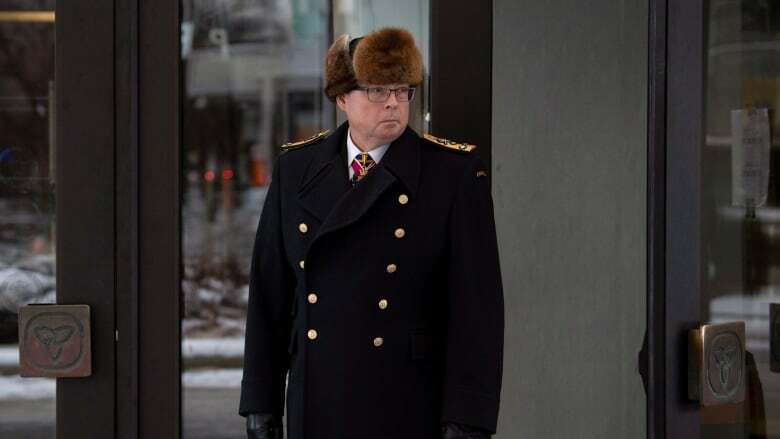 The revelation is the latest twist in the high-stakes prosecution of Norman, the former vice chief of the defence staff, who is accused by the RCMP of leaking cabinet secrets. Les Linklater, an associate deputy minister at Public Services and Procurement Canada, told the Commons government operations committee late Thursday that Matchett has been suspended from his federal government job. He said he was unable to state when it happened and refused to discuss the circumstances of Matchett's suspension, including the reasons for it. "I'm not at liberty to get into personnel management issues," Linklater said when questioned by Conservative MP Kelly McCauley. Matchett has not been charged with any offence. The Mounties acknowledged at the outset of their investigation into Norman that they were looking into more than one breach of secrecy linked to a cabinet committee meeting on shipbuilding early in the Liberal government's mandate. In asking the court last month to force the federal government to disclose documents, Norman's lawyer Marie Henein claimed the federal police force had identified another source for the leak. "The RCMP's investigation discovered that a government employee, Matthew Matchett, gave a lobbyist then working for Davie the classified Memorandum to Cabinet ("MC") and slide deck relating to the Liberal Government's November 19, 2015 iAOR Cabinet committee meeting," Henein wrote in an October court filing. The Mounties refused to comment when asked about Matchett in October, saying that the investigation into the breaches of cabinet secrecy was ongoing. In a subsequent court filing, Henein claimed that the Mounties had not yet interviewed Matchett. Email exchanges released by the court this month suggest Matchett leaked a memorandum to cabinet and a slide presentation to an Ottawa lobbyist, Brian Mersereau, in the days leading up to the cabinet meeting in question. At that meeting, the newly elected Liberal government chose to put a $668 million program to lease a supply ship for the navy on hold. Word of the decision immediately leaked to the media and cabinet eventually reversed course and allowed the project with the Davie Shipyard, in Levis, Que., to proceed. Cabinet ministers were furious, however, and after an internal government investigation failed to determine the source, the RCMP were called in. A detailed reference to Matchett was contained in over 700 pages of documents linked to Norman's case and released by the court two weeks ago. The documents include excerpts of emails and RCMP witness statements — records that have not been tested in court and may not be entered as evidence by the Crown. In one email, Matchett allegedly tells Mersereau on Nov, 17, 2015, that he had "got everything — the motherload." Mersereau, of Hill+Knowlton Strategies, told the Mounties in an interview that a brown envelope with the cabinet documents appeared the next day at his downtown Ottawa office. At the time, Matchett was working for the Atlantic Canada Opportunities Agency, but later moved on to a position at Public Services and Procurement Canada. CBC News has reached out to Matchett on several occasions since his name appeared in the court documents and has not received a response. An earlier version of this story referred to Matthew Matchett as a junior procurement officer. In fact, Mr. Matchett is a director at Public Services and Procurement Canada.